Residents of Mumbai suburbs have been finally blessed with a super cool and shimmery resto-pub in the town. ‘The Flip Bar’ is now open at the Thakur Village in Kandivali (E) and is all set to delight foodies with its amazing atmosphere, appetizing food, classy bar and rocking music. ‘Stunning’ word best describes the ambience of The Flip Bar and what adds to its awesomeness are the catchy artworks presents on the walls. The dimmed light setup, funky furniture and artistic ceiling will make sure that you get just the most perfect relaxation therapy after a busy day at the office. Sports Enthusiasts has an added advantage as ‘The Flip Bar’ hosts a series of Live Sports Screenings too! You will fall for The Flip Bar’s food right from the moment when you dive in the awesome soups served there. The Veg. Manchow Soup was served hot and it surely provided a head-start for the food extravaganza coming our way! Starters always play a vital role in any bar and trust us; The Flip Bar serves some really cool and innovative starters which go perfectly well along with your drinks! 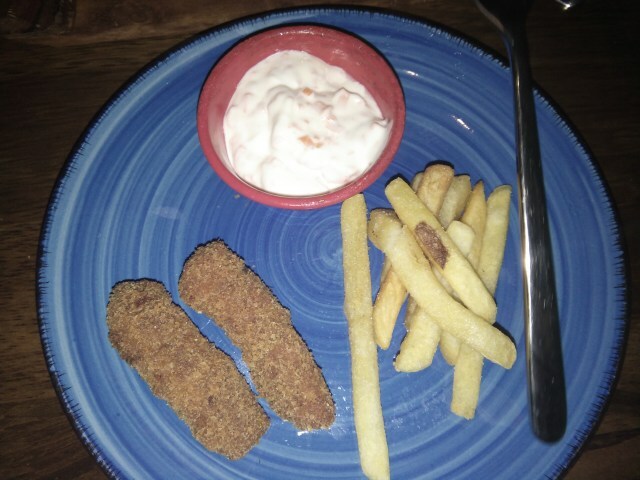 The crispy Masala Fish fingers, served with fries and Tartare sauce certainly delighted our taste buds to the core. Another stellar pick from The Flip Bar’s starter menu is the Chowpatty Crostini! If you are a fan of Mumbai’s iconic Pav-Bhaji like us, then these crispy baguette rounds topped with pav bhaji mash will prove a boon to your hunger and what makes it even more alluring is the pomegranate seeds and coriander sprinkle over it. This dish is surely going to be the next big thing in Mumbai’s food heritage – mark my words! The Flip Bar’s exquisite bar counter offers magnificent cocktails and variety of wines. If you are a wine lover, Yellow Tail Merlot and Jacob’s Creek Chardonnay served there. Apart from this, you can also find a wide range of Gin, Brandy, Whiskey, Beer and Vodka at this full-fledged bar counter! REMARKS: Hiring a professional DJ might just seal the deal for this happening place as the playlist gets too unbearable to handle at some point. Also, the service department should look after the customers more closely we feel! With so many worthy aspects accompanied with foot-tapping music, The Flip Bar is definitely my recommendation if you are looking forward to spend a rocking evening at the Mumbai Suburbs and believe us – its yummy munchies, various drinks and colourful décor won’t disappoint you at any cost. Do check out their Zomato Profile to know more about them. Cheers!